Paving way for 100 per cent computerisation of land records at a modern record room, the cabinet today gave approval for computerisation of mutation orders and evidence of records in the state under the National Land Records Modernisation Programme. Though the state BJP government led by Chief Minister Ramesh Pokhriyal Nishank is leaving no stone unturned in proclaiming a successful completion of the Maha Kumbh in Haridwar as one of its major achievements, the Opposition Congress is also making all-out efforts to counter government’s Kumbh claims. Uttarakhand Chief Minister Ramesh Pokhriyal Nishank will inaugurate a two-day festival of the Rang tribal community living in Darma valley in Dharchula sub division of Pitthoragarh district at Pangu on April 24. The Chief Minister will also inaugurate a six-day culture festival in Kanalichhina block of Pitthoragarh district. This was stated by district officials here. 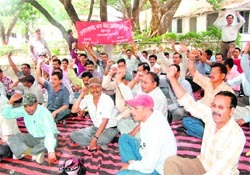 After assurance of BJP MLA Govind Lal Shah, who also heads a committee on forest and wildlife in Uttarakhand, the agitating state forest guards have decided to keep their agitation a low-key affair till Tuesday. Harbhajan Singh Cheema, Deputy Chairman of the 20-Point Programme Implementation Committee, has asked officials supervising implementation of various schemes to conduct on-the-spot verifications. BD Kandpal has retained the post of president of the Nainital High Court Bar Association, the polling for which was held yesterday. He polled 211 votes while his opponents KN Joshi and MC Pant polled 158 and 177 votes, respectively.A total of 546 voters out of 682 cast vote. Expressing satisfaction over his almost three-year long tenure, outgoing Kumaon Commissioner S Raju has stated that people of Nainital should come forward to prevent the place from becoming a concrete jungle. Chief Minister Ramesh Pokhriyal Nishank today offered tributes to Veer Chandra Singh Garhwali, the hero of the Peshawar incident. The ONGC will celebrate the Frontier Basins’ Day in remembrance of the spudding of the first well (Jwalamukhi-1) of the organisation on March 31, 1957, at Jwalamukhi, Himachal Pradesh, here on April 24. The well started the long journey of the ONGC to its current status of one of the premier National Oil Companies of India. The Rama Krishan Seva Mission ashram, Kankhal, has got a grant of Rs 41.41 lakh from the State Bank of India (SBI) for social medical works. According to an SBI press note, the funds will be utilised for procuring medical equipment by the mission hospital. It was a day of rejoice, togetherness and hardwork for students of Kendriya Vidyalaya, IMA, as they celebrated their annual day with great fervour here today. The celebration commenced with a grand opening by the chief guest, Brig Sunil Chandra. The programme initiated with an auspicious ceremony of lighting the lamp followed by the Saraswati prayer sung by the students. Jitender, alias Jiti, who murdered a property dealer on March 6, was arrested by the police while he was reportedly coming to the district court to surrender on the Haridwar road here today. The police arrested 31 persons for gambling and seized about Rs 70,000 and a few cars from their possession here yesterday from a billiards pool under the Basant Vihar police station. With this the land records and orders will be automatically generated, both at the sub-registrar office and at the tehsil level. A Government of India scheme to be implemented at a cost of Rs 200 crore is expected to be completed only by end of 2017, in the 12th Plan period. We have requested the Centre for a change in funding pattern as Uttarakhand is a special category state. We have already faxed a letter asking the Central government to raise the share of Central assistance to 90 per cent and limit the state’s share to 10 per cent,” said Chief Secretary NS Napalchayal, while briefing mediaperson after the cabinet meeting. In another decision, the cabinet also proposed setting up of a separate corporation for the Irrigation Department in order to adjust the employees whose future was at stake after most of the power projects and their maintenance was transferred to the Jal Vidyut Nigam. “The complete modalities, the shape and how money will be raised for the corporation, etc, will be examined and discussed at the next cabinet meeting,” said Napalchayal. At the moment the Irrigation Department is responsible for only two projects namely Aarakot -Tyuni Project (70 MW) and Tyuni-Palasu Project (66 MW). The decision to establish a corporation under the Irrigation Department has been in the works for quite some time now. At the same time the cabinet also announced hike in the licence fee for video libraries as per population. The increase has been from Rs 1,500 to 1,800 (population of 2 lakh), Rs 3,000 to Rs 6,000 (population of 2 lakh-5 lakh) and from Rs 4,000 to Rs 8,000 (for population of 5 lakh and above). In yet another decision the cabinet also changed the structure of the Agriculture Department reducing the subordinate posts in the department from 1,237 to 1,120 and removing anomalies in posts. While Chief Minister Nishank terms the work done by the state government for the Kumbh in Haridwar as historic, the Congress terms these as historic in terms of “corruption” and “poorly done arrangements”. The party is now taking up the Kumbh issue as its potent weapon to corner the state government and it could be on its priority list in the assembly election manifesto too. A mass rally will be taken out from Narsan to Dehradun wherein thousands of Congress workers from the state will try to expose the alleged corruption and mismanagement done by the mela administration in the name of the Kumbh in Haridwar. Union Minister and Haridwar parliamentarian Harish Rawat, along with state Congress chief Yashpal Arya, party leader in the state assembly Harak Singh Rawat and several legislators, will stage a protest and apprise the state Governor Margaret Alva of the irregularities in the Kumbh funds. And this time the party is not only making the protest a symbolic one but has prepared a charge sheet and gathered data of the Kumbh works, funds and their actual usage, delayed projects, aided with negative reports by quality checking agencies like the Shri Ram Institute of Delhi and the Indian Institute of Technology, Roorkee. Lashing out at the mela administration, Congress city chief OP Chauhan cited from his personal experience that this was the Kumbh where the administration tried to block pilgrims from reaching Har-ki-Pauri. “I have seen five Kumbhs and never has locals been confined to their homes and outside pilgrims stopped from reaching the Braham Kund, Har-ki-Pauri ghats by the mela administration,” said Chauhan. While divulging party’s agitational plans, veteran party leader Purushottam Sharma said the party would take the Kumbh issue to the streets and will not let those involved in the corruption go without punishment. “The Chief Minister claimed building of 14,000 toilets but in reality not more than 5,000 have been set up. Similarly, work at the Haridwar bus station has just started though the Kumbh is set to conclude this week. A sum of Rs 2.50 crore had been already sanctioned for the purpose. This speaks of itself that only for 2 per cent work 80 per cent fund had been released and still pilgrims used temporary bus stations only during the Kumbh,” said Purushottam, party’s former city president. While Leader of Opposition in the assembly Harak Singh Rawat had already demanded a CBI probe in the April 14 tragic incident at Birla Bridge, the district Congress will put up the matter before Union Minister Harish Rawat so that he take up the matter with Prime Minister Manmohan Singh. District party president Rajendra Singh said the administration was trying to hide the real number of people who lost their lives in the stampede. “The Chief Minister will land at a temporary helipad at Pangu in Dharchula subdivision of the district at 11 am and will go to Pangu where he will inaugurate a two-day cultural festival. The sports activities of the festival had already started from April 18,” said Navneet Pandey, SDM, Dharchula. “After inaugurating the cultural exhibition, the Chief Minister will release eight books and one video CD on the Rang culture and felicitate some prominent persons from the Rang community,” said Pandey. “Nrip Singh Napalchayal, Chief Secretary, Uttarakhand who is from the Rang community, would be awarded with ‘Rang Ratana’ while Padma Shri Mohan Singh Gunjiyal and well-known mountaineer Chandra Prabha Aitwal will be awarded with ‘Rang Gaurav’ the second prominent award given by the Rang society annually,” said Pandey. After inaugurating a health camp at the Rang festival, the Chief Minister will reach Kanalichhina where he will inaugurate a six-day Kanalichhina mahotsava, and lay the foundation stone for a building of the Police Department. “Keeping the sensitivity of tri-border area, the Chief Minister’s security arrangements have been chalked out in detail and police personnel, who have returned from the Khumbh duty, have been deputed there in big numbers,” said Pandey. The forest guards that are prominently demanding better promotion opportunities and a revised pay scale, today withdrew their forest offices lockup call for two days. “We have been assured by Shah that he would take the matter with the Chief Minister, thus have postponed the lockup programme for two days,” said RR Painuily, general secretary of the Forest Guards Association. He said the forest guards would re-start their agitation with increased intensity from Tuesday if their genuine concerns were not addressed. Painuily also reiterated that the state forest guards that were under training in the states of Himachal Pradesh and Haryana would also be boycotting the training sessions shortly if the state government failed to fulfil their demands. He said the protest rally programme to secretariat too would be delayed and would be taken place any day after Tuesday. Taking a meeting of the officials to evaluate the performance of the district with regard to the implementation of the 20-Point Programme, he said that the officials visiting the field must take stock of every scheme being implemented. Cheema warned the officials not carrying out their jobs sincerely and said that they would be facing stringent action if they do not mend their ways over the next three months. He said, “Officials must not come up with statistics that are far away from ground reality.” He said the government was committed to taking the welfare schemes to the last man. During the evaluation of the Indira Awas Yojana, it was found that the target fixed for Nainital could not be met as no beneficiary could be traced as per the requirements of the scheme. He also ordered the district authorities to conduct surprise raids at shops disbursing edible items and kerosene under the Public Distribution System (PDS) and said that there have been complaints of shopkeepers resorting to making duplicate ration cards and keeping the cards of beneficiaries reserved with them for days together. He also called for the timely renewal of Below Poverty Line (BPL) cards and said that cards not renewed within the given time frame would be cancelled. He also directed the district administration to send notices to contractors who are not completing the tasks given to them in time and follow this up with stringent action. Cheema said that he has once again issued directions to all the District Magistrates in the state to ensure that polythene bags made of material that is less than 20 microns are not used. Anil Dabral was declared winner for the all-important post of general secretary. He polled 247 votes while his opponents AK Joshi and RK Joshi polled 169 and 133 votes, respectively. The three vice-presidents elected for the year are Jagjit Singh Virk, Janki Surya and PS Bisht. Vishal Singh Mehra was chosen as joint secretary (administration) and Vipul Painoli was elected as treasurer unanimously. The election to the post of joint secretary (press) was cancelled on technical grounds and would be held later. Those chosen as members of executive are Tarun PS Takuli, Yogesh Pachaulia, Darshan Singh, Prem Kaushal, Anil Kumar and Bhuvnesh Joshi. Regretting that he was unable to put a total stop to the illegal encroachments and coming up of illegal structures, Raju, however, pointed out that the Lake Development Authority had played a major part in helping Nainital retain its beauty. “There are several positive aspects of the development authority. It has helped preserve the natural beauty and charm of Nainital because of which a large number of tourists continue to visit the place. Improvement in tourist rush management has also led to an increase in the number of tourists every year,” he said. Raju is credited with not allowing rampant flourishing of the builder lobby in the region. Recalling his achievements he said the successful implementation of Operation Butterfly, an initiative of Naitital Administration with the Lok Chetna Manch in managing solid waste management, spoke for itself. The project was now covering 90 per cent of Nainital’s population. However, there were problems on account of non-participation of hotel owners and the trade associations. “This is a unique project with such high community participation and it has now been recommended for a national-level award,” said Raju. He also pointed out at the successful implementation of the aeration concept for the Naini Lake. “This is the only lake in India where it has been successful,” he said. Raju further recalled how Udham Singh Nagar had recorded an unprecedented wheat procurement last year after initial hiccups and how concerned of a large number of Tibetan population had been addressed. Another achievement listed by him was the development of the Administrative Training Institute. “When I had taken over the place was in a bad shape and questions were being raised on its survival. I was able to market the training institute well and we got funds to the tune of Rs 13 crore and the whole place was revived,” he added. Pointing at another one of his initiatives which was still hanging fire was the proposal to allow increase in height of buildings in Nainital and compounding of small holdings. He said once these proposals were clear the pendency of cases before the development authority would come down considerably. state sponsored schemes which is not utilised,” he pointed out. He added that another major problem of shortage of doctors in remote areas could only be addressed if a transparent transfer policy was made at the state level like the one applicable in Himachal Pradesh. He also expressed hope that the increasing number of medical colleges in the state would provide enough young doctors, who could be posted in remote areas to address the concerns of the population residing there. At a function held in Peetsain in Pauri Garhwal district, Dr Nishank said the life of Veer Chandra Singh Garhwali would continue to be an inspiration for the coming generation. The Chief Minister also inaugurated Alophathic Hospital at Masoo. He also laid foundation stone for health sub centre, Bangalee, and primary health centres, Bughdhar. Both are to be constructed at a cost of Rs 86 lakh. The Chief Minister also laid foundation stone for construction of RCC motor way at Thalisen at a cost of Rs 105 crore. Dr Nishank also announced making Janata Inter College Ufrakhal a state government college status. The Chief Minister asked Pauri District Magistrate Dilip Jawalkar to convert Masoo, the ancestral village of Veer Chandra Singh Garhwali, into an ideal village. He announced providing Rs 1 lakh each to Chopra Chauthan and Mahila Mangal Dal and Rs 5 lakh to Rat Jan Chetna Manch. He also announced providing Rs 4.5 lakh for setting up a degree college in Thalisen. As an extension of this celebration, a kavi sammelan will be organised at AMN Ghosh Auditorium, ONGC, on the Kaulagarh Road here. A CD of poems of Padma Bhushan Dr Gopal Das “Neeraj”, will be released in the sammelan. The function also includes the release of a book of poems by Sarveshwar Singh, an in-house talent of Frontier Basins followed by recitation of Neeraj’s poems by Sonia Anand. Chief Minister Ramesh Pokhriyal “Nishank” will grace the occasion as the chief guest. DK Pande, Director (Exploration), ONGC, and Narendra K Verma, GM (Basin Manager), will also attend the function. Other renowned poets who would enchant the audience with their poetry include Dr Suman Dubey, Madhu Mohini, Manjeet Singh, Kunwar Bechain, Dr Suresh Awasthi, Gajendra Solanki, Dr Nawaz Devbandhi, Ratan Singh Jaunsari and Dr Atul Sharma. The grant was given by SBI Chief Manager Rajesh Goyal, along with other bank officials, to Swami Nitya Sudhanand Maharaj at the ashram. SBI local Branch Manager Sanjay Handa said the bank not only taught people about the savings, but it also was a forerunner in social services. Rajesh Goyal said such initiatives went a long way in helping people. Noted writer KL Deewan has been conferred by a Punjab-based society with the Hindi Garima Samman for his exemplary contribution to the Hindi language. KL Deewan informed that he was called on by Patiala-based Bhasha Bhawan Society, wherein he, along with other selected personalities, was conferred with the award. Till date, Deewan has penned five stories, three poems, two short stories and his several articles have published in leading journals and newspapers. Presently he heads Deep Shikha Manch a literati-based society in Haridwar. Youth Congress activists have lauded the work done by Haridwar MP and Union Minister of State for Employment and Labour Harish Rawat being carried out in the constituency. Addressing youth activists meeting today, party city chief Ravish Bhatija said since last parliamentary elections several works had been carried out in the constituency by the parliamentarian. Bhatija cited ESI Medical College and a hospital in the district, for which over Rs 1,000 crore had been approved by the efforts of the minister. Lashing at the BJP, Youth Congress leader Dr Jitendra Bhatt said to hide its failure in Haridwar the BJP leaders were targeting Rawat while the fact was that he had been active in the district more than even local State Urban Minister Madan Kaushik. Ashish Chaudhary, Kanhaiya Lala Chancal, Mohit Sharma, Farooq Ahmed, Bhola Sehgal, Ahmed Siddiqqui, Deepanshu Sharma, Parag Mishra, Shobhit Singhal among others were resent in the meeting. Chandra awarded meritorious students of academic year 2009-10. Apart from studies, the prizes were distributed among the students excelling in extra-curricular activities. Outstanding student Priyanshu Joshi was awarded with bravery award for saving his sister from a leopard. Other highlights of the function were a colourful cultural programme presented by students. The entire event was a coalition of dance, singing and drama. Students of the primary section showcased a glimpse of various Indian culture and states in our country. To add variety to the function, English play “Marriage Proposal”, Sanskrit skit “Raghu Udarta” and Hindi play “Free Style Gawahi” was enacted that gathered appreciation by the crowd. Students also recited poems, conveying message for the people to keep the environment clean. The Principal gave the vote of thanks. The cops have recovered a pistol and about five cartridges from his possession. The police said he was arrested along with one person who was escorting him on the car. The police added that he had been staying in different places while he was on the run. He told the police that he had recently got done a stone operation in Delhi and was in a condition to be hospitalised. However, the police said he might have got done some treatment just to get away from severe remand of the police. Meanwhile, he had been sent to jail at the Dalanwala police station. It may be recalled that he had killed Babbal on a property dispute and both of them were history-sheeters as per the police record. There are 17 criminal cases registered against Jiti, while 13 criminal cases are registered against Babbal in Dehradun. Jiti had reportedly four sharp shooters to shoot Babbal. The only success in this case the police had was arresting of Jaideep, driver of Jiti, on the day of the murder. But despite police’s claims that it had got vital clues about the whereabouts of the accused and would nab him soon on the basis of the information gathered from the driver, it had just gathered dust in the investigation. Today, Dehradun Senior Superintendent of Police (SSP) Abhinav Kumar lost his calm over a news item aired against him. He reportedly threatened the journalist, who covered it, and was asked not to attend the press conference to be conducted by him on Jiti’s arrest. The DGP assured them of looking into the matter and asked the journalists to meet him tomorrow in this regard. Police officials said that they were gambling with billiards as a facade. They used to play cards staking money on them. Omvir Rawat, Station House Officer of the Basant Vihar police station, said that the police had been receiving information about this for a past few days and yesterday, it raided the place and found them gambling. The SHO added that they had been gambling here for a long time and had made the billiards pool their den for the purpose.